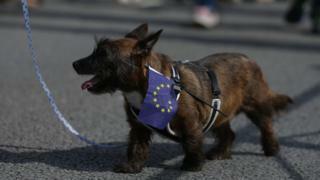 Pet owners who want to take their animals to the EU face having to make plans at least four months in advance if there is no Brexit deal. This worst-case scenario is set out in the latest batch of government papers about planning for leaving the EU without a deal in place. Currently pets can travel with their owners throughout the EU thanks to the pet passport scheme. But without a Brexit deal, the UK will become a “third country”. Reality Check: Are pet passports under threat? 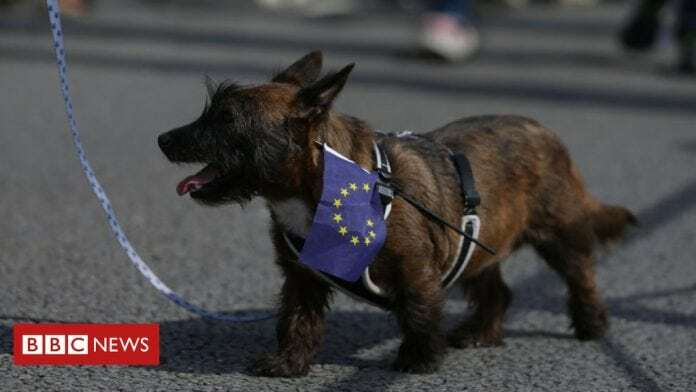 At the moment people can take their dogs, cats or ferrets from the UK to the EU and back again without quarantine using a pet passport, for which the animals need a rabies vaccination and a microchip. EU chief negotiator Michel Barnier has previously said “the ability… of dogs and cats to cross the Channel” will be affected if the UK leaves the EU without a deal – a scenario both sides say they are keen to avoid. According to the government’s advice for pet-owners, the scale of checks required in a no-deal scenario will depend on which category the UK falls into. These no-deal notices will make uncomfortable reading for many businesses and consumers, but also for the government. In dry, technical language they make clear that many aspects of day-to-day life could be affected significantly if the UK leaves the EU with no deal at all. These include air and coach travel (which could in theory come to a temporary halt), food labelling, driving in Europe for business or pleasure, and taking your pet across the Channel. The government argues that these warnings represent contingency planning for a worst case scenario, but until they can guarantee that a deal will be done, preparations will have to be made. And with time running out, people will have to start acting on some of the advice as soon as November. The prospect of a no-deal Brexit is beginning to loom large. The government said it was pressing to become a “listed” third country when the UK leaves the EU in March 2019, which it says would avoid “burdensome” changes to requirements. But if it becomes an “unlisted” third country, pet-owners wanting to travel with their animals to EU countries would need to discuss this with a certified “Official Veterinarian” at least four months in advance. They would need to prove their pets were free of rabies – which could involve a vaccination followed by at least a 30-day wait before a subsequent blood test, which itself is then followed by a three-month waiting period before travel. The government says it believes reaching a deal with the EU is the most likely outcome but that it is its “duty as a responsible government” to prepare for the failure to reach one. The latest batch of 24 no-deal papers also includes warnings that airline passengers could face disruption, coach travel to the EU could be suspended and UK residents may not be able to access online services like Netflix while on European holidays.